This page in German / Diese Seite auf deutsch. On this page you will find a map of Laos and some information about the country. The map is a detail of a Map of the World published by Planet Poster Editons in Germany. This Map of the World costs 11.50 Euros, it is described in detail at www.planetposter.de (only in German) and can be ordered at www.wissenladen.de. Number of inhabitats: see www.citypopulation.de. Map of Laos with surrounding areas. - Landkarte von Laos. - Mapa de Laos. - Carte de Laos. The capital of Laos is Viangchan (Ventiane), which is also the biggest city of the country. Flights to Laos usually go to Viangchan. Another important city is Louangphrabang. Laos is located between Vietnam and Thailand, its northern neighbours are Myanmar and China, in the south Cambodia. The official language of Laos is Lao. Lao is written in a script of its own, which is also called Lao, and derived nearly 1000 years ago from a Khmer script. 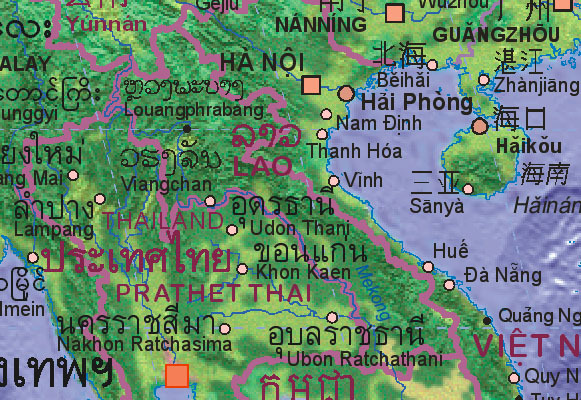 On our map we have given the Lao spellings for the names of Lao, Viangchan and Louangphrabang. Lao had been some time under French colonial administration. The Names of localities appear often in (outdated) French spellings. In modern transcriptions it is not any more Vientiane, but Viangchan, which is closer to the Lao pronounciation. Tourism is of lower importance in Lao. The people of Lao suffered heavily in the Vietnam War, where US soldiers burnt down large areas of forests, destroyed and devastated many villages and small towns. Thousands of persons were killed. The poor country had no chance to do something. The Lao people never had done any harm to the United States. We would appreciate more detailed information, also about tourism, flights, or individual tours to Laos. This is our Map of the World with original scripts (original size 70 x 100 cm), from which the detailed map shown above has been cut out. The numbers of city inhabitants and vegetational zones were researched by hand for every country, by using the sources listed below. This procedure prevented the map from containing traditional errors provoked by simply copying such information from previous maps. The map can be ordered for 11.50 Euros (+ postage and packing) at www.wissenladen.de. The vegetational base map was aligned with satellite pictures from Google Earth. The official names of the countries are quite well researched at www.geonames.de. Also here you can find information on the geography of many countries: www.geographixx.de. The numbers of inhabitants of the cities were taken from www.citypopulation.de. And the mountain peak altitudes were largely derived form www.peakbagger.com. This is the link to the sitemap, where all areas with maps are linked. The Map of the World was compiled by F. Welter-Schultes (Planet Poster Editions, Göttingen, Germany). Copyright (c) 2006 R. Krätzner & F. Welter-Schultes. Commercial reprints of detailed maps like this one, including on commercial web pages, are not principally excluded, but require explicite permission of the publisher. We will be pleased to grant such a permission, prices are individually negociable and certainly not too expensive. Please contact fwelter#gwdg.de (replace # by @, this is to avoid spam mails). Reprints for non-commercial purposes are even less complicated - but also in these cases please inform the publisher in advance, and in any case mention the source www.planetposter.de.